[T]here’s a formula to these phenomena, a specific life cycle, and it repeats ad nauseam even as the things themselves change. … First, you have your organic murmur around a genuinely cool thing: your local blog pick-up, your increasingly high-profile RTs [re-tweets]. Then there’s that tsunami of identical, aggregated posts from every brand and online outlet trying to cash in on the clicks. And, finally, there’s a sort of receding afterglow, a last-ditch search for any sort of permanence or meaning: the parody Twitter accounts, the Slate pitches, the novelty Halloween costumes … this very thing that you’re currently reading. Commentators there on the quotidian micro-obsessions of the Internet described Pizza Rat as a “spirit animal” for the city. Indeed, this is a good reason to isolate briefly this particular viral image in order to ask what it might tell us about the specific crystallization of media, information, and collective identification in 2015. The eminent anthropologist Claude Lévi-Strauss famously told us that “animals are good to think with.” In his short book simply titled Totemism, however, Lévi-Strauss dismissed this cornerstone of his discipline as “the phantasmagoria of the theorists.” Given the symbolic force of animals in today’s mediascape — think of that other recent meme, Cecil the Lion, killed by a dentist from Minnesota — one wonders, however, if Lévi-Strauss carved the epitaph of the totem too early. (I argue this in my recent book, Look at the Bunny: Totem, Taboo, Technology.) Negotiating New York’s infamous subway system is one of those traumatic experiences that all citizens here share, and it thus helps forge what a contemporary anthropologist might call a “negatively reinforced social bond.” The MTA, in this scenario, plays the role of an abstract and vilified Big Other for New York’s harried commuters, to almost sacred Durkheimian proportions. What began, more than a hundred years ago, as a gleaming triumph of subterranean engineering and progress, has since become an abject abscess, frustrating locals and appalling tourists alike. 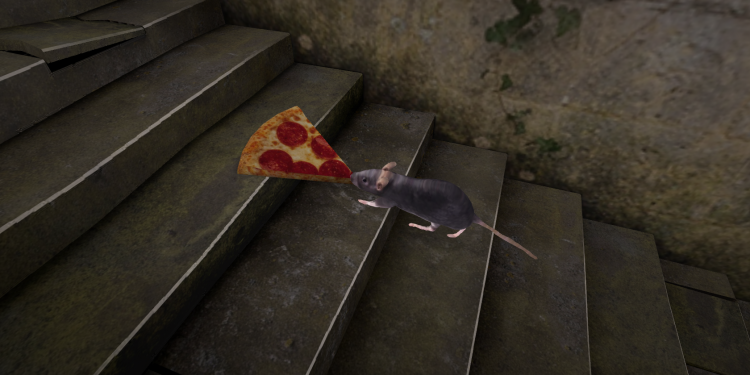 Pizza Rat thus became, if only for the blink-of-an-eye, a totem of the scandal that is the post-2008 economy. Weary commuters could instinctively relate to the need to wolf down a pizza slice (arguably NYC’s other most significant totem), while racing to a 12-hour work day. On the one hand, the economy is “good.” People are working, as evidenced in the necessity to wait for the third or fourth train during rush hour, just to find space to squeeze in. It is clear, however, that very little of the wealth created by all this hive of activity is being fed back into either the bank accounts of the workers, nor the infrastructure needed to support those doing the work. We all know by now that the trickle effect was a ruse, and the better metaphor would be a vacuum cleaner in the sky, sucking the remaining money out of the pockets of the 99%. Interestingly, the evolution of the New York pizza slice is also symptomatic of the massive hollowing out of the middle class in this country. The classic slice — which used to be unofficially tied to the standard subway fare, as the Chinese yuan was once pegged to the US dollar — has now diverged. You are most likely to find a (barely digestible) slice for one dollar, or a gourmet slice for at least five times that amount. There are almost no options left in the middle, since the gluten-providers have figured out there are now only two markets: the poverty-liners and the aristocrats. 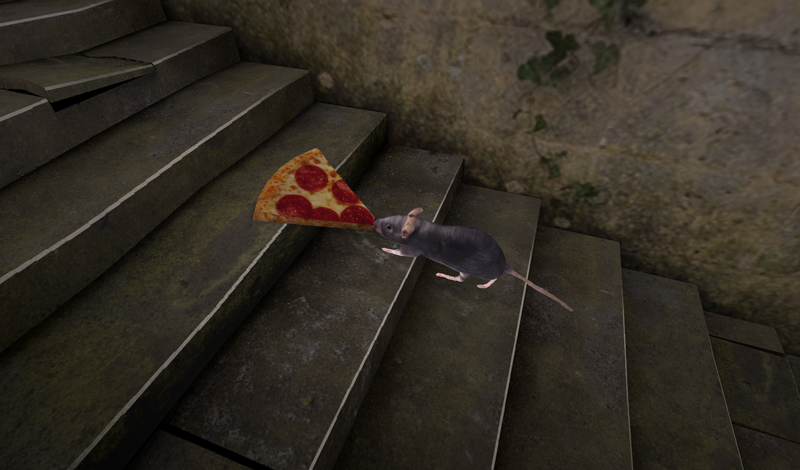 So when we saw Pizza Rat, struggling with a slice of unknown origin, we empathized with the struggle for sustenance and the socio-economic gauntlet that it involves. This, I submit, is why the totem, as a highly-charged symbolic figure, is in fact as powerful as ever in human affairs, albeit in altered, modern, technologized form. This generation is particularly obsessed with the virtual image of animals, as John Berger maintained, at the very moment real animals recede from our urban view. As such, the other main fauna of New York City — the roach, the pigeon, and the rat — become something closer to co-inhabitants than avatars of animality. Pizza Rat caught our attention, in its cheesy-greasy paws, because, as a culture, we need to humanize the animal, as a way of feeling more human ourselves and less estranged from the fellow creatures we betrayed by inventing abominations like the New York City subway system. In the same gesture, we animalize ourselves, by virtue of this recognition or empathy between species. On the steaming platform of the L train, the difference between rat and human — both caught up in the rat race, and both munching on pizza — is as subtle, and possibly meaningless, as that distinction people make between creative director and graphic designer.